It’s been a strange few days. I thought mid week that Spring might actually be here to stay. 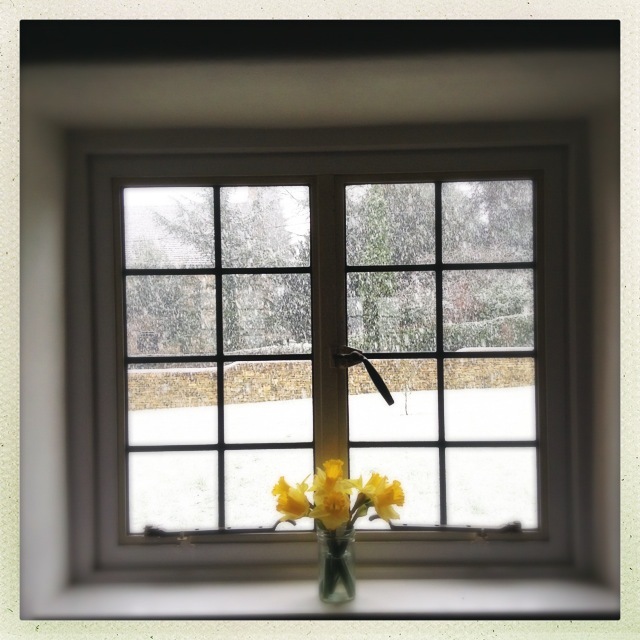 It was warm, sunny and the house was full to bursting with daffodils. I started thinking about Spring flavoured food to cook and enjoy rather than warming Wintery soups to slurp. I even turned the heating off for a bit and told the children to put jumpers on when they complained of being cold. And now it’s snowing. Big, thick, fluffy flakes of snow have been falling since 7 this morning and all I want is a full roast dinner followed by crumble and custard. But back to last week. 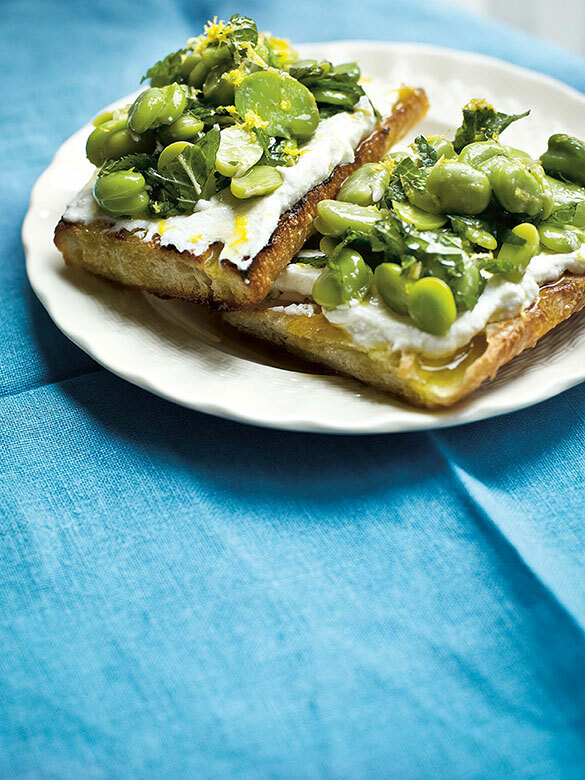 When the sun was shining and the birds were singing, I decided to make Polpo’s Broad Bean, Mint and Ricotta Bruschetta. It was so good that I shall be eating it come rain, snow or shine for the rest of the year. I’ve made it twice since Thursday. I admit to cheating the first time and buying ready podded beans. I was hosting a working lunch “meeting” and had my 2 year old running around and it just wasn’t the right environment for a relaxing hour of podding. The second time however, I popped and podded and the result was even more delicious. Here’s the recipe and finished dish straight from the pages of Polpo and a picture of my market bought beans pre pod. I tried it the second time with Mozzarella rather than Ricotta – just roughly chop up some good quality Buffalo Mozzarella and mix with some good olive oil and salt and pepper. It made for a much messier Bruschetta but surely that’s half the fun. 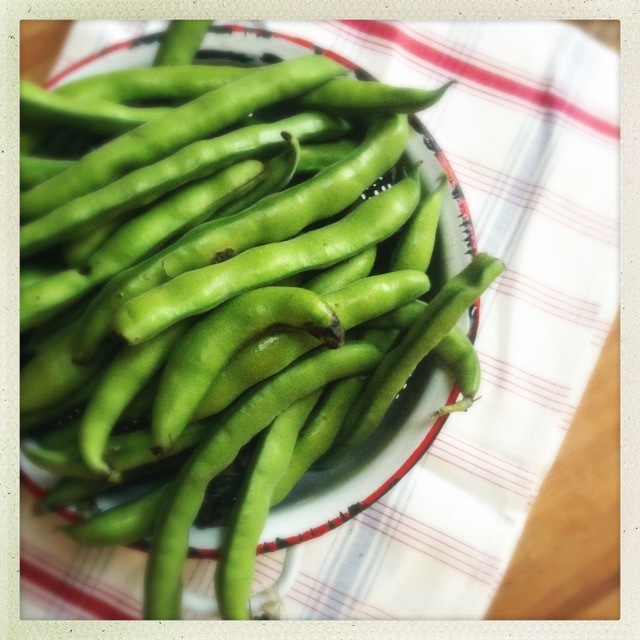 Place the broad beans into boiling water for 5 minutes, remove and plunge into cold water. Then drain and skin them. Put them in a small bowl and dress them in the olive oil, the zest, a little lemon juice, most of the mint, salt and pepper. Toast or grill the slices of bread so that they are crunchy on the outside but still have a bit of give when squeezed. Rub one side of each slice with the cut side of the garlic. The clove will melt into the bread’s hot surface. Spread the fresh ricotta, with salt and pepper added to taste, on to the hot and prepared bread. Top with the broadf beans and garnish with the remaining chopped mint. And to finish, a little bit of Cotswold snow on a Sunday in March.